Imprime y... viva las acuarelas! ¿Qué método se utiliza para la impresión? 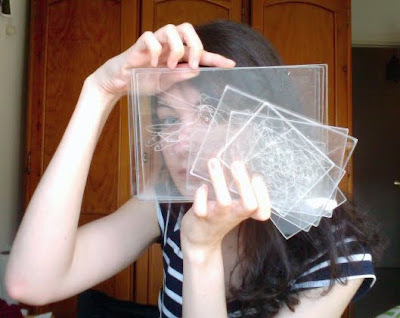 I used drypoint to make this methacrylate plates. Then I printed them with different inks. I'll upload some photos of the results some day. How was the green applied? I studied it at the University for two years (as part of the whole art degree), but sadly none of the pictures I posted are made with printmaking technics. I haven't still uploaded any of the results jet. Btw, I'm really glad you wanted to show my work. Thank you and good luck with the studies! Thanks Adara, This was really helpful. I was a bit at a loss on how you created such perfect negative space with some of the images and shapes. So with something like this one which is just tagged drawing http://www.flickr.com/photos/imop/4075582408/in/set-72157623760143326/ it has no digital editing? Sorry I keep asking you so many questions, thanks for baring with me.